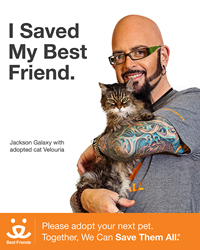 Star of “My Cat From Hell” on Animal Planet, Jackson Galaxy joins other celebrities in supporting national animal welfare organization Best Friends Animal Society http://www.bestfriends.org and the efforts to end the killing of dogs and cats in our nation’s shelters. With more than 9,000 dogs and cats killed in our nation's shelters each day, we find ourselves at a crossroads, a place where our choices can change things in a profound way. Cat behaviorist by day and rock n’ roller by night, author, and star of “My Cat From Hell” on Animal Planet, Jackson Galaxy is the latest celebrity to show his support for national animal welfare organization Best Friends Animal Society’s efforts to end the killing of dogs and cats in our nation’s shelters. Galaxy joins Danny Trejo, Carrie Ann Inaba, Denise Richards, Nils Lofgren, and other celebrities who are featured in Best Friends’ photo campaign featuring celebrities posed with their personal rescued dogs and/or cats in support of the Save Them All® call to action. The new season of “My Cat from Hell” premieres at 8 p.m. Saturday, April 26 on Animal Planet. In addition to starring in ‘My Cat From Hell’, Galaxy is the show’s executive producer, author of “Cat Daddy: What the World’s Most Incorrigible Cat Taught Me About Life, Love, and Coming Clean” and the upcoming book, “Catification.” Galaxy also has deep roots in animal welfare. He worked in an animal shelter for almost 10 years and specializes in environmental and behavioral enrichment in a rescue setting. He recently launched a ‘Team Cat Mojo’ campaign to attract those who want to build a community focused on making life better for all animals. Galaxy said: “With more than 9,000 dogs and cats killed in our nation's shelters each day, we find ourselves at a crossroads, a place where our choices can change things in a profound way. I’m extremely proud to stand side-by-side with Best Friends to help raise awareness about the importance of adopting shelter animals and spaying and neutering to control population. Each time this positive choice is made, not only is a life saved, but we move one step closer to Saving Them All." Best Friends Animal Society is the only national animal welfare organization focused exclusively on ending the killing of dogs and cats in America's shelters. An authority and leader in the no-kill movement since its founding in 1984, Best Friends runs the nation's largest no-kill sanctuary for companion animals, as well as life-saving programs in partnership with rescue groups and shelters across the country. Since its founding, Best Friends has helped reduce the number of animals killed in shelters from 17 million per year to about 4 million. Best Friends has the knowledge, technical expertise and on-the-ground network to end the killing and Save Them All®. To like Best Friends Animal Society on Facebook go to: http://www.facebook.com/bestfriendsanimalsociety. Follow Best Friends on Twitter: http://twitter.com/bestfriends.